Education advocates are concerned that a ballot measure aiming to preemptively outlaw future sales taxes on services would block future tax reforms aimed at generating more money for K-12 schools. Proposition 126 would amend the Arizona Constitution to bar the state, counties and cities from ever imposing a sales tax on services. That would effectively permanently exempt a wide array of services, ranging from health care to car repairs to haircuts. Realtors have thus far been the sole funder of the measure. Through its Realtor Issues Mobilization Fund, the Arizona Association of Realtors has already provided at least $5.1 million to collect the signatures needed to put the citizen initiative on the ballot and fund a barrage of television ads in support of the measure, while the National Association of Realtors has chipped in $1 million. State law currently exempts most services from taxation, and the state Constitution already makes it extremely difficult to expand on what is taxed because the Legislature requires a two-thirds vote to increase any tax. But though tax increases at the Legislature are difficult to accomplish, they aren’t impossible. And some critics of Prop. 126 worry that the initiative will foreclose future attempts at reforming the state’s tax code by shutting the door to taxation of services. Through the years, lawmakers have frequently proposed expanding the sales tax base to include services as a way to generate more revenue for the state. Such proposals are sometimes packaged with plans to lower the overall state sales tax rate of 5.6 percent, which has attracted bipartisan support. According to the Arizona Department of Revenue, the state passed up about $5.2 billion in revenue during the last fiscal year by not taxing services. Even if a two-thirds majority were attainable in the Legislature, taxing some services, such as health care, which accounts for nearly $2.1 billion, doesn’t seem politically feasible. But things like legal services, accounting, consulting, cosmetology, education, waste collection and others could generate more than $3 billion in revenue at the current sales tax rate. Prop. 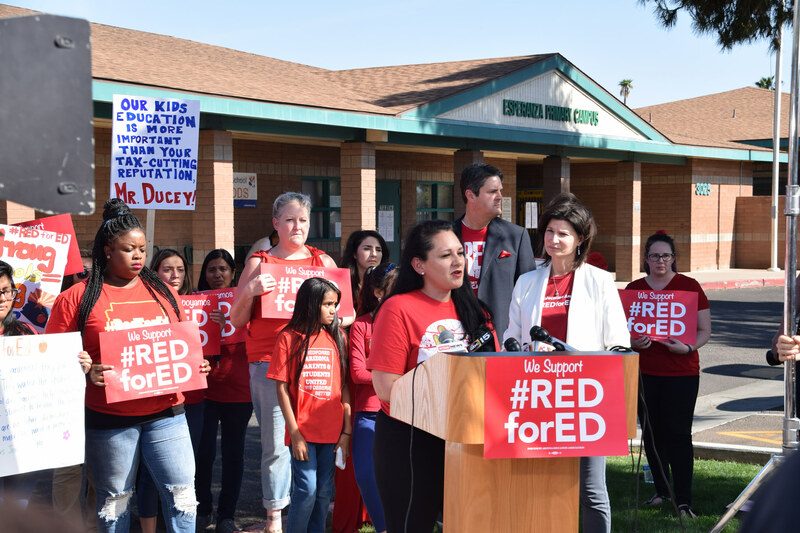 126 comes as calls for more K-12 education funding reached a fever pitch following the advent of the #RedForEd movement and the subsequent teachers’ strike earlier this year. As a result, advocates collected about 270,000 signatures to put the Invest in Education Act on the November ballot. That measure would have dramatically raised income tax rates for Arizonans who earn more than $250,000 per year. The Arizona Supreme Court kicked Invest in Education off the ballot last month. But the calls for more funding haven’t gone anywhere, and the campaign lives on. Dana Naimark, the executive director of the Children’s Action Alliance, the coalition that supported Invest in Education, said the campaign is crafting a proposal for more K-12 funding that it plans to present to the Legislature for consideration in the 2019 session. It’s too early to say precisely how it will propose to raise new revenue to better fund public education, but Naimark said broadening the state’s sales tax base to include businesses ought to be an option. She noted that both liberals and conservatives have made similar proposals in the past. But if Prop. 126 passes, that will no longer be an option. Naimark said the Invest in Education campaign hopes Legislature will simply muster the two-thirds supermajority needed to pass a tax hike. If not, she hopes lawmakers will refer a funding plan to the ballot, which would require only a simple majority of voters to approve it. But if the Legislature does neither of those things, Naimark said there will be another ballot measure to raise taxes for education in 2020. “The status quo is unacceptable and the crisis continues. It is not over, and we can’t afford to lose another 10 years of kids going without what they need in their classrooms,” Naimark said. In recent years, Democrats in Arizona have become more hostile to the idea of increasing sales tax rates on the grounds that it’s a regressive tax that hits low-income people especially hard, and that sentiment is reflected in the Invest in Education campaign. Other members of the coalition are focused more on income taxes than sales taxes. Arizona Education Association President Joe Thomas said the Legislature needs to have as many options as possible, and that his organization’s board of directors has officially opposed Prop. 126. But he still thinks an income tax hike on wealthy Arizonans is the better way to go. “The tax revenue that we were looking at on Invest in Ed was extremely popular, and it will be popular if it runs again. It’s a winner,” Thomas said. Prop. 126 has also generated opposition from some conservatives as well, including the Arizona chapter of Americans for Prosperity, a national free-market conservative group. Andrew Clark, the group’s state director, said Americans for Prosperity wants taxes to be as close to zero as possible. But if there are going to be taxes, they should be imposed fairly and equally. And by exempting some businesses from the sales taxes that other businesses pay, Clark said Prop. 126 would insert a “rigged economic system” into the Arizona Constitution. If Prop. 126 fails, Clark said he expects to see policymakers engage in a broader discussion about tax reform that would include broadening the sales tax base while lowering the rate, which he said has support among both Democrats and Republicans. Clark also worried that, if Prop. 126 passes, it will eventually reduce tax revenues as the consumers shift from buying goods to services. If revenue drops, he said that will create pressure to raise other taxes. “Conceivably, if you’re just left with goods as something you can tax and the share of goods in the marketplace continues to dwindle, it only stands to reason that the most logical outcome is you’re either going to have increase the tax rate on goods, which is already pretty high in this state, you’re going to have to increase the income tax, or you’re going to have to increase property tax,” he said. Economist Jim Rounds, a Republican, described Prop. 126 as a shortsighted policy being pushed to benefit a single industry. He said many of his fellow economists don’t share his concerns because a new tax on services is unlikely. But that’s not a good reason to constitutionally prevent future changes to a major part of Arizona’s tax code, he said. “I have a feeling that it’s going to (get approved). And in about five years, we’re going to look back at it and say, ‘We should’ve spent more time,’” Rounds said. Even if the tax rate stays the same, Rounds and others warned that Prop. 126 could reduce state revenues due to long-term economic trends that have seen consumers eschew physical goods in favor of services, often of the digital variety. For example, many consumers pay for digital music streaming services rather than buying music on compact discs. “The point is, we don’t know what might be coming down the road with new technologies in the future. We don’t know how the world’s going to continue to change. It makes no sense to make this restriction where it would make it nearly impossible to later change,” Rounds said. In addition, determining what constitutes a service or a good isn’t always easy. Ed Greenberg, a spokesman for the Arizona Department of Revenue, said doing so is sometimes a complex process that can involve decades’ worth of case law, statutes, rules and administrative actions. The agency is neutral on Prop. 126. Though Realtors are funding Prop. 126, their industry is already protected from the services-based sales tax that the measure would prevent. Nicole LaSlavic, vice president for government affairs at the Arizona Association of Realtors, said the group successfully pushed an amendment to the Arizona Constitution in 2008 that bars real estate transfer taxes. But there are other real estate-related services that could still be subjected to taxes, such as financing, home inspections and air conditioning installation. And many other services unrelated to real estate could also be subjected taxes, she said. LaSlavic said Democratic lawmakers through the years have introduced legislation to expand the sales tax base. But stopping such taxes became more important to the Realtors’ association in 2016, when state Rep. Darin Mitchell, R-Litchfield Park, introduced legislation to impose taxes on a number of financial and other services. Despite the fact that Mitchell’s bill never even got a hearing in committee, LaSlavic said the Realtors decided to take action. She said additional sales taxes would hit low-income Arizonans especially hard. “We have protections in place for our industry that were established in 2008, so our efforts moving forward really aren’t about us. They’re about the other service industries that exist,” she said. Though other industries would be the greatest beneficiaries of Prop. 126, only the Realtors have provided funding for the campaign. LaSlavic declined to comment on why other industries or stakeholders are providing funding for the campaign. So far, the campaign for Prop. 126 has been completely one-sided. The Realtors have spent millions on the campaign. Meanwhile, opponents haven’t even formed a committee. Clark, Naimark and others have engaged in talks about a possible opposition campaign.